Fast 50: Focus On Retention Over New Customers. Sell to Customers in the way they want to be sold to. 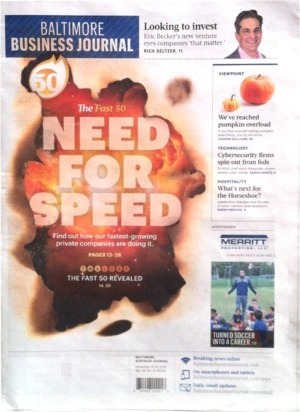 Home > NewsRelease > Fast 50: Focus On Retention Over New Customers. Sell to Customers in the way they want to be sold to. Baltimore Business Journal published an Article of Interest by John M. Collard, turnaround specialist, interim executive, outside independent director, and private equity advisor. Baltimore Business Journal is published by American City Business Journals for the Business, Finance, and Investing Community. Sell new products and services to existing customers. Sell existing products and services to new customers. With that in mind, it is up to 10 times more costly to acquire a new customer than to retain an existing one. Most companies spend their marketing on acquiring new customers, but don't forget the more predictable source of revenue right under your nose − existing customers. The rule that 80% of revenue comes from 20% of your customers often applies. In my experience with underperforming companies, there is a lack of focus on the fundamentals of selling and marketing. Get back to basics to understand your buying audience. Determine what the customer values, in what context he values it, and how he measures that value. Honestly answer some questions regarding your focus, and make changes to hone your approach. What is your customer trying to accomplish? What customer needs will and will not be satisfied? What is the benefit to the customer of the product we provide? What is the generic customer need that motivates them to buy? Why will the customer buy from us, what are our distinct competencies? You must differentiate your product and company from the competition. The answer to one simple product-related question really predicts success or failure. The problem is that most marketers ask the wrong question, and sales show poor results because of it. The wrong question: "What product do I want to create?" This doesn't sound wrong, it makes sense, and even caters to what you like to do. Don't get emotionally attached to stuff that you would want. The dilemma is that your audience may not be ready for your product. A better question is: "What does my audience say it wants right now?" It is a much easier sell when you deliver a solution to your customer because they are pre-sold. Develop an account management and customer service philosophy and utilize incentives tied to customer's goals to establish the importance of these functions. Continue to understand what your customer values and how you can improve their results. Work with customers to increase what you can provide to grow their business and they will grow yours. Also, be sure to offer complimentary products and services. I had a client in the printing business who began to offer digital versions of catalogs, forms, and CDs in addition to just their pre-press and print services, which increased sales by 150 percent. Talk with your clients. Listen to them. Follow some of these tips, and watch the sales come in. John is a Certified Turnaround Professional (CTP), and a Certified International Turnaround Manager (CITM), who brings over 35 years senior operating leadership, $85M+ asset and investment recovery, 45+ transactions worth $1.2B, and $80M fund management expertise to run troubled companies, serve on boards of directors and advisors, advise company boards, litigators, institutional and private equity investors, and raise capital. John has parachuted in as the Interim CEO, CRO or senior executive to turn around a trouble entity, and serves as an outside director. John is Chairman of Strategic Management Partners, Inc. (410-263-9100, www.StrategicMgtPartners.com ) in Annapolis, Maryland. John is inducted into the Turnaround Management, Restructuring, and Distressed Investing Industry Hall Of Fame. John is Past Chairman of the Turnaround Management Association (TMA), Past Chairman of the Association of Interim Executives (AIE), and a Senior Fellow of the Turnaround Management Society. John is a Founder of TMA. John is Prince George's Business Leader of the Year. John is honored with the Interim Management Lifetime Achievement Award from the Association of Interim Executives. John is winner of Corporate Intl Magazine Global Award for Corporate Recovery Specialist of the Year. John is honored as Most Admired CEO in Maryland by Daily Record. Strategic Management Partners, Inc. (www.StrategicMgtPartners.com 410-263-9100) is a turnaround management firm specializing in interim management and executive CEO leadership, asset and investment recovery, corporate renewal governance, board and private equity advisory, raising capital, and investing in underperforming distressed troubled companies. SMP helps clients restore value to troubled companies, prepare entities for 'cash out' at maximum value, recover assets for fund investors, support litigation, and invest private equity into distressed opportunities. The firm has been advisor to Presidents Bush (41 & 43), Clinton, Reagan, and Yeltsin, World Bank, EBRD, Company Boards, and Equity Capital Investors on leadership, governance, turnaround management and equity investing. SMP is celebrating 25+ years of service to its clients. SMP was named Maryland's Small Business of the Year, and received the Governor's Citation, Governor Martin J. O'Malley, The State of Maryland as a special tribute to honor work in the areas of turning around troubled companies and saving jobs in Maryland. Turnarounds & Workouts Magazine has twice named SMP among the 'Top Outstanding Turnaround Management Firms'. American and Baltimore Business Journals named SMP among the Most Active Turnaround Management and Consulting Firms in Baltimore, Washington, and the Mid-Atlantic Region. Global M&A Network Turnaround Atlas Awards named SMP as Boutique Turnaround Consulting Firm of the Year . SMP is winner of Corporate Intl Magazine Global Award for Interim Management Specialist Firm of the Year. SMP is recipient of the Turnaround Management Firm of the Year by Acquisition Intl Magazine. Strategic Management Partners, Inc.: turnaround managers ready to run troubled companies, recover assets from investments gone bad, advise boards of directors and investors on company viability in distressed situations. We provide strong interim and operational leadership, strategic planning, financial, defense conversion, sales and marketing acumen developed building organizations in large and small companies, including President of public & private middle-market companies providing solutions to Commercial, Federal Government, International markets. Enterprises range from start-up to $100+mil. Industry expertise: Manufacturing; Job Shop; Engineering Services; Computer Processing/Services/Software/Integration; Communications; Defense Electronics; Aerospace; Federal Government Contracting; Systems Integration; High-Tech; Finance; Marine Services; Real Estate Development; Construction; Fabrication; and Printing. www.interimexecs.org/john-m-collard Past Chairman of the Association of Interim Executives (AIE). Past Chairman of Turnaround Management Association (TMA). Collard Writings.